The Pensacolian – Tell my story. The Pensacolian, April 1912. There are very few issues of this rare publication in existence. Trust me. I’ve been looking for it for over three years. Tah-dah! Jacki said that the publication is FULL of political ads, but Emmett has one the most valuable/visible positions for an advertisement — the back cover. Jacki said that the publication is full of ads, but only Emmett has the cover. This was a rather expensive ad; the timing of it was important, too, as the first primary election for U.S. 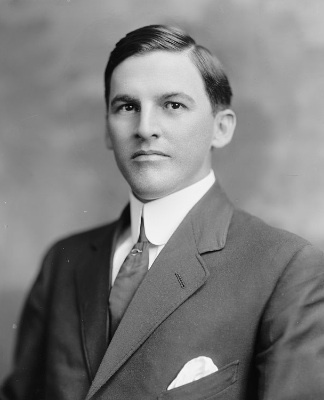 Congressman was held on April 30, 1912. There was three candidates running — Emmett, Dannitte Mayes, and W.W. Flournoy. Typically, there was a second primary between the top finishers on the Democratic ticket — but this year, Flournoy came in third, and Mayes chose not to run against Emmett in the second primary because of Emmett’s overwhelming lead. Of course, the description that he is “…Good Material for a Congressman” is interesting. No one touched the fact that Emmett was a full-blown alcoholic, or said anything about it publicly (much unlike today’s media coverage). At this point, Emmett likely hid his drinking pretty well, except from family members and his closest friends. If his alcoholism was obvious, there’s no way he’d have made it this far, running on the ‘clean-cut young man’ platform. I’d love to have more information, more political materials, especially the extremely elusive “Emmett Wilson Club” button (which was given out right after Emmett won the primary; the club was short-lived because Mayes ceded the election within days of the election results). I wonder if Emmett (or his family and friends at the time) could have even guessed that almost 100 years after what had to have been an embarrassing, frustrating, and dysfunctional life and death, that he’d be making amends of sorts — i.e., being ‘of service’. Bringing people together in the spirit of family and friendship in curious and satisfying ways? It seems ironic, and oddly fitting, for a complicated man who might have lived another kind of life if only Bill Wilson (no relation) and AA had been around.